Welcome to the primary focus of my shared Classic Halo Universe. So what is it? 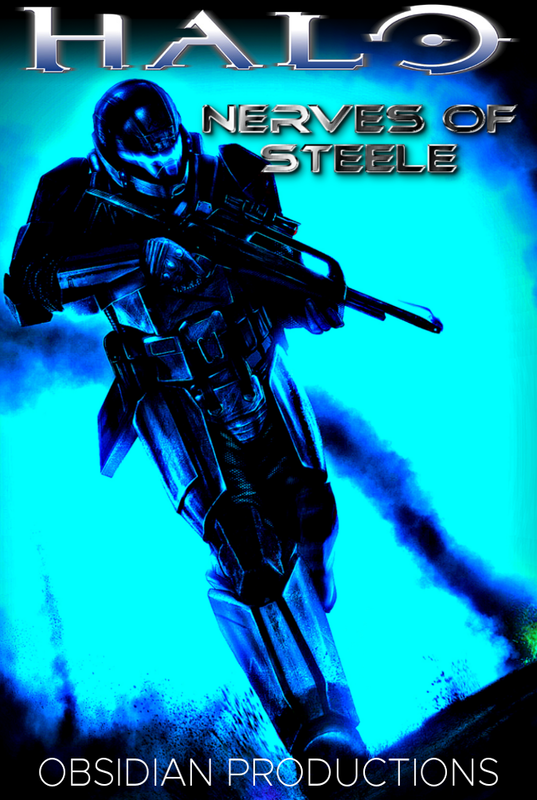 Nerves of Steele is the culmination of fifteen years of writing, planning, thinking about writing and planning Halo fan fiction, reading Halo books, and playing Halo video games. It’s the biggest thing I will have ever attempted to take on. Yes, bigger than my comprehensive novelization of DOOM, which right now stands at over 250,000 words and is only 1/4 of the way finished. Yes, bigger than my 15-novel, 3-novella, 9-short story original franchise The Shadow Wars, which collectively stands just shy of 1.1M words. Naturally, I plan to be writing this one for…I don’t know, probably a decade. Clearly, I have my priorities straight. Why is it going to be so long? Why am I doing this? Am I insane? Yes, I am, but that’s nothing new. As to the why questions, well, I’ll give the best answer I can. I’ve been writing Halo fan fiction for 15 years. I covered my ‘career’ of doing that on this page. I played a lot of Halo, I came up with a lot of ideas to shove into the Halo universe. Some I got to writing (poorly), some I abandoned because they were either crap or lost relevancy, and some I never managed to get around to and I still think would be wicked cool to write about. Ever since leaving the Halo fandom in 2013, I’ve kept thinking about it, and over the years, those ideas never really stopped coming. So I’ve decided to pack (almost) all the best of them into a single massive series. I want Nerves of Steele to be several things. I want it to be a massive crossover franchise, I want it to be an awesome action-horror series, I want it to be a love letter to the original Halo trilogy that tries to recapture the magic of those games and even expands on it, I want it to be a reimagining of those stories I got my start writing way back when, and probably a dozen other things I don’t even realize right now. Also, I want it to be the longest fan fiction in the Halo section. So with that in mind, I’ve been collecting, sorting, editing, trimming, expanding, re-sorting and trimming again, and studying a vast network of ideas for a few years now, and the stories that you can read below are the culmination of all that work, and all the work of bringing them into the world in written form. Because I’m complicated, this series will have two forms of division. The first and broadest will be Arcs. The second will be Books. Each Arc will encompass several Books, and typically an Arc will be a broad storyline being followed. The more I write, the clearer it will become. But don’t worry, this won’t be unnecessarily complicated. Occasionally there will be a little time skip, maybe a week or a month at most after an adventure and before the next one picks up, but you can just start reading and keep reading without having to keep track of anything but what chapter you left off on. Although there is one caveat I want to add onto that. Since this is a shared universe, to get the full impact, you really should be reading the other stories as well. I hope you enjoy this project. I know I will.